Beautifully symbolic, the FTD® Loving Light™ Dishgarden offers an uplifting sentiment for friends and family during a birthday, anniversary, life change, time of need, or just because. This stunning grouping starts with sunny yellow chrysanthemums elegantly arranged in a natural woodchip basket with an assortment of lush plants. 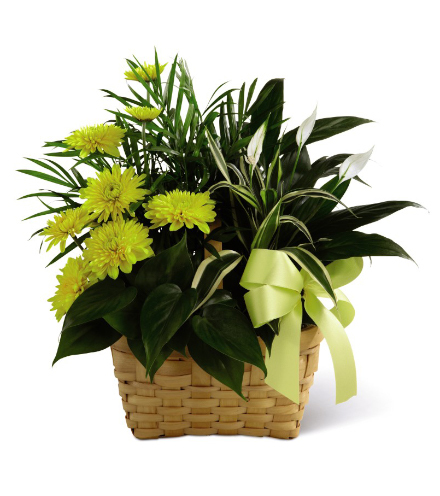 A palm plant, peace lily, dracaena and philodendron plant come together to create this lasting gift. This gorgeous plant arrives fresh at the recipient’s door with your card message included.